How does SatisMeter for Shopify work? How SatisMeter for Shopify works, and how to set it up. 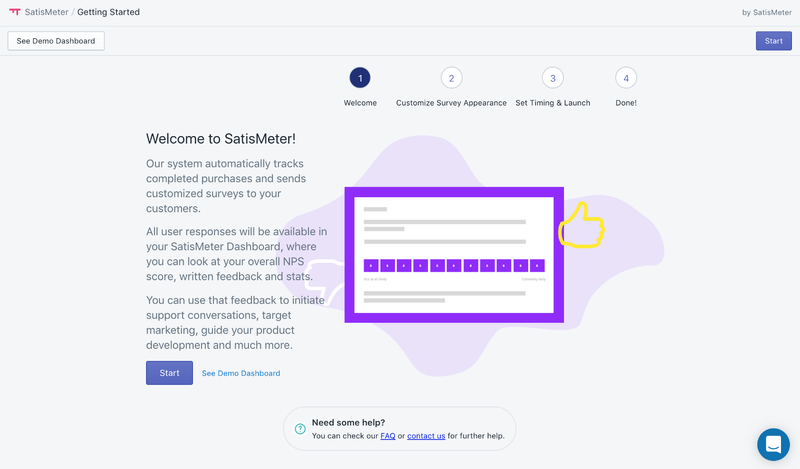 SatisMeter automatically sends NPS surveys to your customers and then helps you use the results. If you don’t know what NPS is, check out this article which covers the basics. After a customer receives a purchase from your store, we send them an e-mail survey asking them for a number rating, and written comments. These results are then sent to your SatisMeter dashboard, where they can be filtered, searched, and analysed. Feedback in the dashboard is tied to existing customer profiles, so finding out who thinks what is always simple. How do I set up SatisMeter? Configuring your SatisMeter account is simple, we’ve broken it down into 4 steps. After clicking “add app” in the Shopify store, you’ll be prompted to allow SatisMeter to access your Order data in Shopify. We need this to send surveys. Click install and you’ll begin our on-boarding process. At this stage you can view a demo dashboard. Click “start” to begin customising. At any point during the installation you can click the chat icon in the bottom right corner to get live support. In this menu you can alter the appearance of the e-mail surveys your customers will receive. Start by changing the shop name, and primary colour to reflect your own branding. Select the language you want for surveys from the drop down list. If you want to further customise the survey text, click “edit text” to access the full text menu. Once you’re happy with the text and appearance of your survey e-mails it’s time to set up the correct timing. 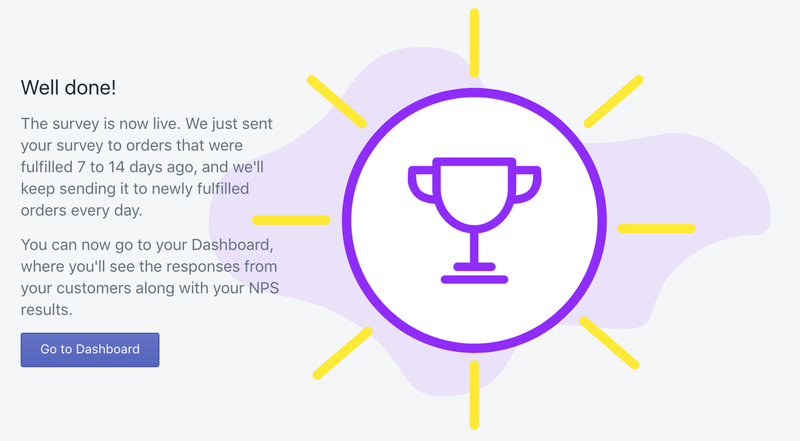 NPS surveys should be sent after your customer has received their purchase, and had a day or two to try it out. Alter the delay after fulfilment to reflect your stores delivery times. It’s better to set the delay slightly longer, so that if delivery gets slowed down, customers won’t get surveys early. 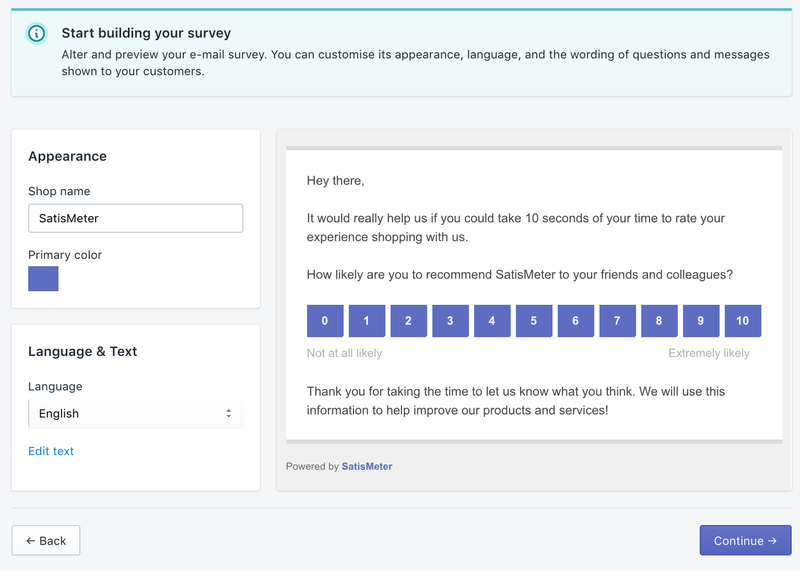 SatisMeter will send surveys on orders that have already been made, so as long as you have been fulfilling orders, surveys should start sending right away. And it’s that simple! Click “launch” to start sending surveys. You’ll be taken to your dashboard which will soon display your customer feedback. You can go back and change any of these settings whenever you like.